Louisville Kentucky Mortgage Lender for FHA, VA, KHC, USDA and Rural Housing Kentucky Mortgage: What is the minimum Credit Score Needed to Buy a House and get a Kentucky Mortgage Loan? What kind of credit score do I need for a Mortgage Loan Approval in Kentucky in 2019? When applying for a Kentucky mortgage loan, lenders will pull what they call a "tri-merge" credit report which will show three different fico scores from Transunion, Equifax, and Experian. The lenders will throw out the high and low score and take the "middle score" For example, if you had a 614, 610, and 629 score from the three main credit bureaus, your qualifying score would be 614. Most lenders will want at least two scores. So if you only have one score, you may not qualify. Lenders will have to pull their own credit report and scores so if you had it ran somewhere else or saw it on a website or credit card you may own, it will not matter to the lender, because they have to use their own credit report and scores. Most Kentucky Mortgage lenders will pull your credit report for free nowadays so this should not be a big deal as long as your scores are high enough. 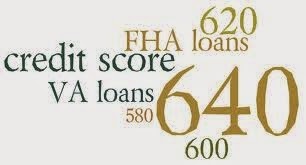 The Secondary Market of Kentucky Mortgage loans offered by FHA, VA, USDA, Fannie Mae, and KHC all have their minimum fico score requirements and lenders will create overlays in addition to what the Government agencies will accept, so even if on paper FHA says they will go down to 580 or 500 in some cases on fico scores, very few lenders will go below the 580 threshold. Kentucky FHA Credit Score Requirements--500 minimum score****If below 580, will need 10% down payment. Most lenders will not go below 620. As you can see, 620 is the minimum score with most lenders for a FHA, VA, or Fannie Mae loan, and 620 is required for the no down payment programs offered by USDA and KHC in Kentucky for Kentucky First Time Home Buyers wanting to go no money down. According to the "Washington Post," Fannie Mae raised its minimum credit score for conventional loans in 2009 from 580 to 620. Even if you have a 20-percent down payment, you can be rejected if your score is below 620. Fannie Mae will also reject a loan if more than 45 percent of your income goes toward paying debt. Kentucky FHA Mortgage Loans recently changed its minimum credit score to 500 with 10 minimum% down payment , and 580 or higher score which qualifies you for lending programs that require only a 3.5 minimum percent down payment. Kentucky VA loans are 100-percent financed and set aside for active and retired military, along with their families. There is no minimum credit score to qualify, though a better credit score will get you a better interest rate. Typically to get approved on A Kentucky VA loan, you will need a 580 mid score with no bankruptcies or foreclosures in last 2 years with clean credit since BK or Foreclosures. If borrowers have credit scores of 640 or below, additional compensating factors will need to be documented for the Kentucky USDA Home Loan Underwriters. Your current credit profile – how you have managed your credit to date will affect how a particular action may impact your score. For example, new information on your credit report, such as opening a new credit account, is more likely to have a larger impact for someone with a limited credit history as compared to someone with a very full credit history. The change being reported – the "degree" of change being reported will have an impact. For example, if someone who usually pays bills on-time continues to do so (a positive action) then there will likely be only a small impact on their score one month later. On the other hand, if this same person files for bankruptcy or misses a payment, then there will most likely be a substantial impact on their score one month later. How quickly information is updated – there is sometimes a lag between when you perform an action (like paying off your credit card balance in full) and when it is reported by the creditor to the credit bureau. It's only when the credit bureau has the updated information that it will have an affect on your FICO score. Why can't I see my credit report and FICO score update daily? Your credit report and the associated FICO score do change regularly, but rarely on a daily basis. Lenders typically report updated account information to the credit bureaus every month, which may or may not result in a change to your FICO score. In a given three-month time period, only about one in four people has a 20-point change in their FICO score, so it's not that helpful to check your report and score on a daily basis. You can certainly purchase reports daily, but more often than not you will not see changes on a daily basis. If you are interested in monitoring your credit report and FICO score for significant changes Score Watch may be a good fit for your needs. Score Watch monitors your Equifax credit report on a daily basis and sendsservice alerts via email or to your cell phone notifying you of relevant changes to your Equifax credit report and/or FICO score. To learn more about Score Watch, click here. Public Record: Generally 7 years, although unpaid tax liens can remain indefinitely.